"Such is the power of the magic word, sound produces forms and beings, sound animates"
The first bones that form in the human body in utero are the small bones of the middle ear. It is the sense of hearing that develops first, and through this the human brain is stimulated and evolves. So it is through sound that we are introduced to our new world, and hearing is the last sense that diminishes at death. "Every aspect of one's being in which sound manifests has a peculiar effect upon life, for the activity of vibrations has a special effect in every direction. The knower of the mystery of sound knows the mystery of the whole universe." - Hazrat Khan. From the very beginning, whether through the songs of birds, the rustling of water through streams, the sound of wind through the trees, or the clap of thunder in the sky, sound impacts our existence. It is how we communicate with each other, and through incantations or song, it has lifted our spirits above, and created a bridge from the seen to the unseen. 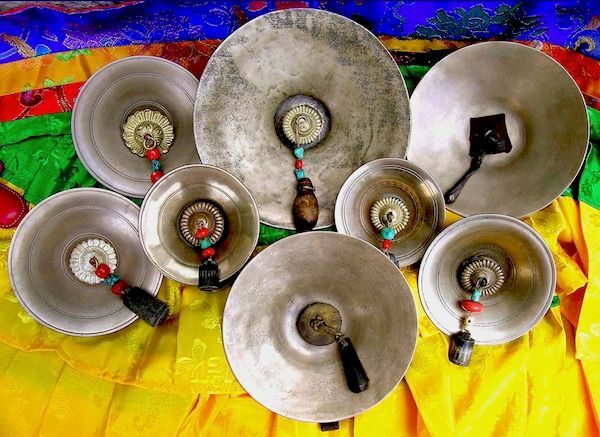 All forms of spirituality, from whatever origin in the world they come, sound is an integral element to creating a compact with a higher transcendent source. All rituals and ceremonies are perfumed with sound and music, that link the listener to the divine. We can trace our inimitable association to sound through Archaeomusicology which reveals a 14,000 year relationship. Cuneiform tablets from Sumero-Babylonian sources show musical notation dating back 3400 years ago. And tablets unearthed from the Chaldean Temple complex at Nippur divulged not only musical notation, but songs and musical instruments used at that time. In fact, the Babylonians considered musicians the guardians of all forms of harmony in their civilization. The study of sound provides a key to understanding universal law. Our word harmony comes from a root which means " to be joined together". Energy fields nest within energy fields aligned by the harmony of the standing wave helix or Golden Spiral. This is what the ancients came to realize with sound and music, they confirmed their findings in Astrology and Mathematics, and regarded music and sound the means to keep not only the world in harmony, but culture, behavior, and the Soul of man in harmony as well. And things that disturbed this harmony or disharmony is not only the correspondence to harmony, but it also required musical scales and instruments to keep things in balance. So music and sound becomes this important science, and musicians become the first line of defense against disharmony. And because musicians could play discursive sounds that could instigate disharmony in the world, the ancient Masters insisted that a sacredness be taught with music, and that tuning's and scales became secret, along with the esoteric teachings of music. That's why Hazrat Khan said it was the highest of all the sciences. Certain notes, melodies and rhythms become sacred medicine for the soul, capable of transforming the biological resonance of the human body, and the opposite is also capable of happening where certain notes, melodies and rhythms can create the opposite effect. The Sound that can destroy the Base, that can annihilate the world. The creative and destructive nature of sound. Harmony and disharmony. With everything at stake, the musician becomes the high priest, and the one solely responsible for keeping harmony in place for the world. Sound is the First Cause, and through this revelation Sound becomes sacred. Itzhak Bentov points out in his book Stalking the Wild Pendulum: " we can associate our entire reality with sounds of one kind or another, because our whole reality is a vibratory reality." The study of sound provides a key to understanding universal law, and through this insight the ancients referred to this as Spiritual Harmonic Knowledge; the advanced esoteric level of initiation on the studies of the power of multidimensional fundamental harmonics. The vision of a world in which man or woman participates in a seamless existence, indivisibly united with the universe around them.